A Delta IV rocket stands ready for a twilight liftoff from Cape Canaveral on Saturday with a powerful military communications satellite set to join the Wideband Global Satcom Constellation operated by the U.S. Air Force. Saturday’s 75-minute launch window opens at 23:44 UTC, 7:44 p.m. local time at Florida’s Space Coast, just ten minutes after sunset. 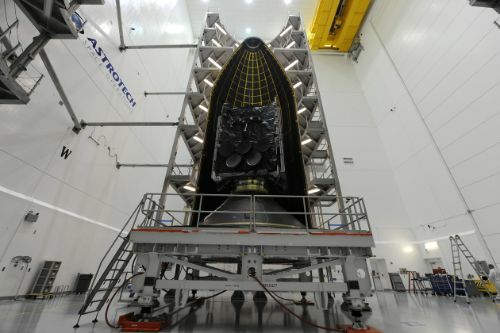 Hidden under Delta IV’s payload fairing is the ninth Wideband Global Satcom (WGS) satellite, funded by five international partners that, in return for their monetary contribution, receive access to global bandwidth provided by the WGS satellite constellation. Weighing in at almost six metric tons, WGS 9 is set for a 42-minute ride atop the Delta IV rocket, targeting a Supersynchronous Transfer Orbit from where the satellite will maneuver to an undisclosed location in Geostationary Orbit. WGS builds the backbone of the U.S. military’s global communications network, providing high-throughput communications to a variety of ground terminals on ships, jets, unmanned drones and communications packages carried by individual soldiers. Comprising ten Geostationary Satellites when complete, WGS is operated alongside the Air Force’s AEHF and the Navy’s MUOS communications architectures that fulfill specialized functions for ultra-secure and mobile communications while WGS handles high-bandwidth communications for a wide user base. The WGS project was initiated back in 2001 as a replacement for the aging Defence Satellite Communications System and Global Broadcast Service Satellites – consolidating two programs into a single system using state-of-the-art spacecraft to increase communications capabilities by a factor of ten and further shield communication pathways from outside tampering. 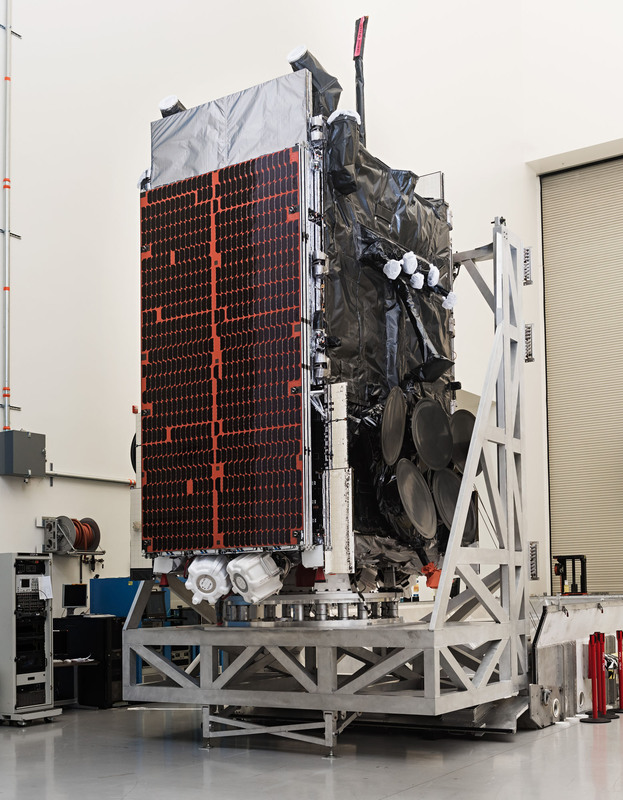 The WGS satellites are built by Boeing based on the flight-proven 702HP platform and each offers 19 communications beams in the Ka- and X-Band frequencies with a unique feature of crossband communications in which the satellite converts the two frequency bands to enable a highly flexible communications network. The WGS 9 satellite was financed by the program’s international partners, Canada, Denmark, the Netherlands, Luxembourg and New Zealand in exchange for access to bandwidth through the global WGS architecture. Funding for the satellite was secured in 2012 upon which the U.S. Air Force opened access to WGS to the five nations that contributed to the ninth operational satellite. 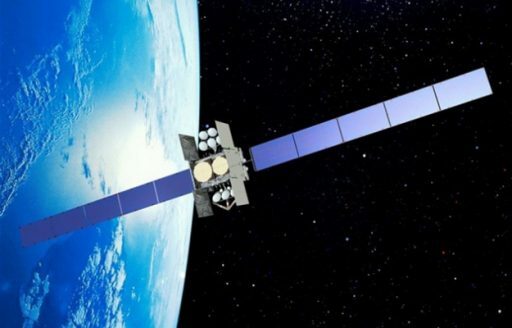 The international deal with WGS 9 was sought by the Pentagon to add another satellite to the constellation for global bandwidth enhancement and additional robustness while supplying allied nations with access to secure connectivity anywhere on Earth, also simplifying coordinated efforts in the field. A similar deal was made with Australia that provided funding for WGS 6 to gain access to the global WGS network. 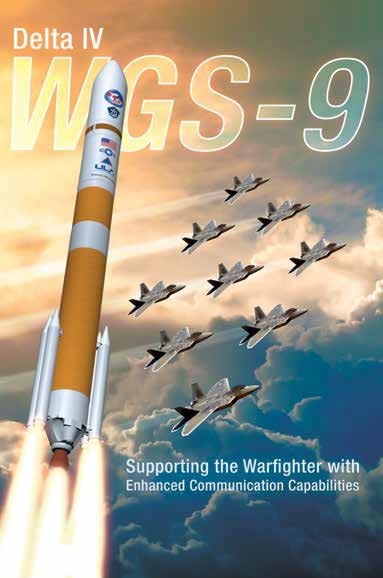 WGS 9 comes with a price tag of $424 million and represents the second in a series of improved Block II satellites the first of which launched last December on a Delta IV rocket to further enhance the constellation’s throughput capabilities. WGS was inaugurated in 2007 with the Block I of satellites each supporting a throughput of 2.1 to 3.6 Gigabits per second. 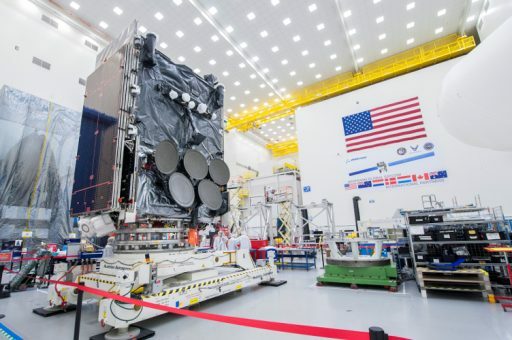 A total of three Block I satellites were launched through 2009 before Block II was introduced with WGS-4 in 2012, offering a higher throughput of 6 Gbps and optimized communications for unmanned aerial vehicles that require high-bandwidth and low-latency communications. Four Block II satellites were launched before an enhanced Block II version debuted with WGS-8 in December, hosing a Wideband Digital Channelizer which builds the heart of the satellite’s communications package, tasked with the conversion of uplink and downlink signals between the different frequency bands. Built around new Application Specific Integrated Circuit Technology, the new channelizer boosts the satellite’s data throughput to 11Gbps while also opening up more flexible communications and releasing additional bandwidth to users. Communications provided by WGS can range from unclassified signals to encrypted signals to cater to a variety of needs. WGS supports video relay from unmanned drones, voice calls and data messages such as maps provided to soldiers in the field, and quality-of-life services such as television and E-Mail services for troops in remote areas of the globe. Operated from Geostationary Orbit where their orbital velocity matches that of the Earth’s rotation, the satellites remain locked over a specific spot over the globe, each delivering 19 high-throughput communication beams: eight are electronically-shaped X-Band beams provided by separate phased array antennas, ten are steerable Ka-Band beams delivered by gimbaling dish antennas, and the remaining beam is a global X-Band coverage zone to deliver broadcast services. The orbital delivery of the 5,987-Kilogram WGS 9 satellite requires Delta IV to fly in its most powerful ‘single-stick’ version known formally as the Delta IV Medium+ (5,4) – featuring the Common Booster Core used in all Delta IV versions, the larger five-meter version of the Delta Cryogenic Second Stage and four GEM-60 Solid Rocket Motors that deliver the kick needed to send the satellite into a Supersynchronous Transfer Orbit. 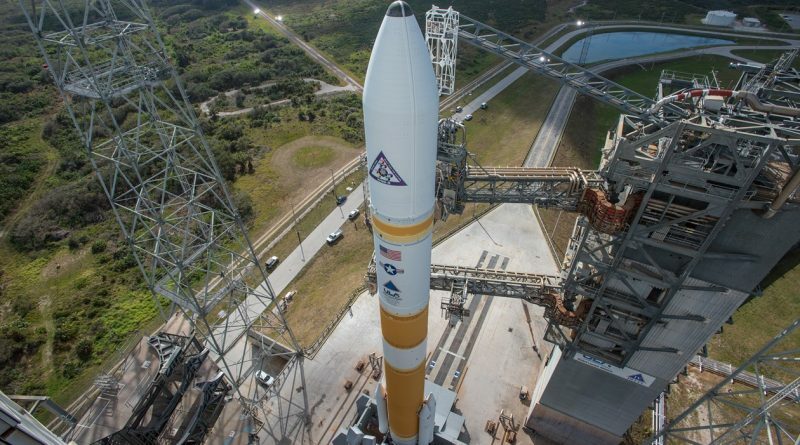 This version of Delta IV has flown seven times before, all in support of WGS and Saturday’s mission will mark the 35th launch overall for the Delta IV family. 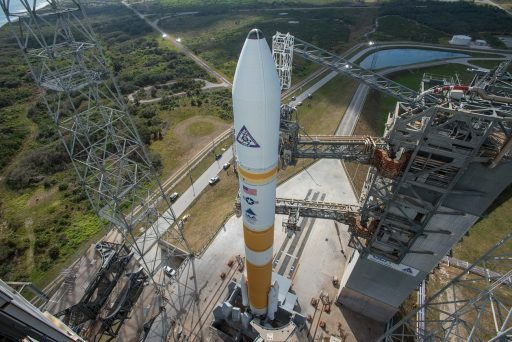 The single-stick Delta IV versions will soon become a thing of the past, looking at retirement in 2019 with three more launches remaining after Saturday night’s mission as ULA shifts all medium- and intermediate-class missions over to the Atlas V as part of cost-cutting measures, consolidating the company’s launcher fleet. Ultimately, both Atlas and Delta will be replaced by the Vulcan launcher that is currently under development as a modular launch vehicle capable of covering the entire spectrum of missions. 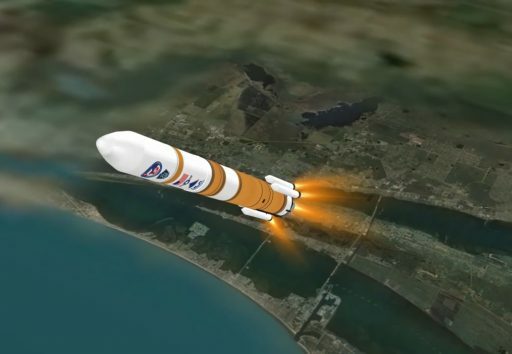 Until Vulcan is operational, the tri-core Delta IV will continue flying into the 2020s to ensure the U.S. government’s heaviest satellites have a proven way to orbit. Mission Managers convened on Friday for the Launch Readiness Review and provided the all-clear for the Delta 377 mission, allowing launch preparations to head into a terminal phase leading up to Saturday’s countdown to set up for a twilight liftoff from Space Launch Complex 37B at Cape Canaveral Air Force Station. Meteorologists are predicting favorable conditions for the day’s launch window, issuing a >90% chance of acceptable weather with only a slight concern associated with cumulus clouds forming in front of a cold front that will push into Florida on Sunday. 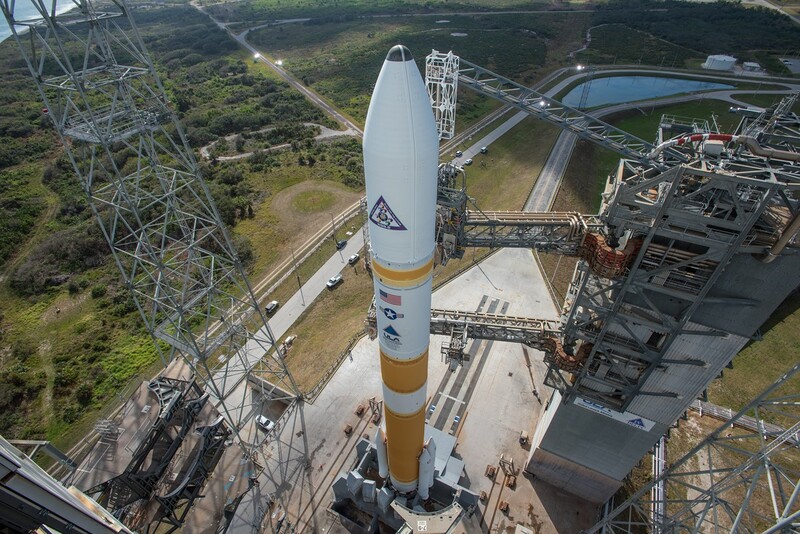 Delta IV countdown operations will be initiated Saturday afternoon, beginning just before noon, local time, when the Mobile Service Tower will be retracted to reveal the 66-meter tall rocket atop its Cape Canaveral launch pad. Propellant loading operations pick up at 20:20 UTC to fill the two-stage rocket with supercold Liquid Oxygen and Liquid Hydrogen propellant with the first stage receiving 202 metric tons of the cryogenic propellant combination and the five-meter second stage is loaded with 27,220kg. When entering the final hour of the countdown, Delta IV will complete engine steering checks and receive an optimized version of its flight software as teams proceed into a final hold of the countdown at T-4 minutes for a status check prior to committing to terminal countdown operations. At T-0.04 seconds, Delta IV is committed to launch with Booster Ignition occurring simultaneously with Hold-Down Release and liftoff of the launch vehicle, thundering uphill with a total thrust over 750 metric ton-force. Delta IV will rise vertically for the first seven seconds of flight before pitching and rolling onto the standard south-easterly departure on a launch azimuth of 93.46 degrees to reach a Geostationary Transfer Orbit, flying into the dark of night over the Atlantic Ocean. Delta IV will pass the speed of sound just over half a minute into the mission and encounter Maximum Dynamic Pressure at T+46 seconds. 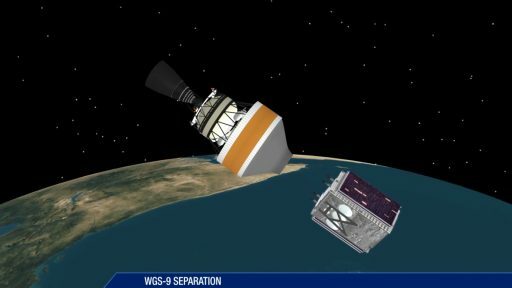 Payload fairing separation occurs three minutes and 15 seconds after liftoff when Delta IV will have departed the dense atmosphere, revealing WGS-9 for the rest of its journey into orbit. RS-68A will finish its job three minutes and 56.5 seconds after liftoff and the 40.8-meter long Common Booster Core separates six seconds later to drop away from the Delta Cryogenic Second Stage. 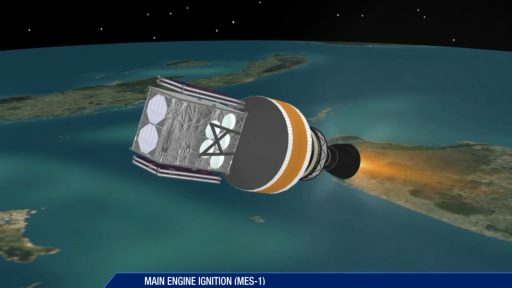 Once clear of the first stage, the RL-10B-2 engine will deploy its nozzle extension for ignition on its first of two burns at T+4 minutes and 16 seconds. Generating 11,200 Kilogram-force of thrust, RL-10 will first fire for a long burn of 15 minutes and 38 seconds to lift the stack into a Low Earth Parking Orbit for a brief coast phase of just under ten minutes. This short passive flight phase allows the stack to reach the proper position for the second burn to place the high-point of the Supersynchronous Transfer Orbit at the proper position for phasing into the GEO Belt. 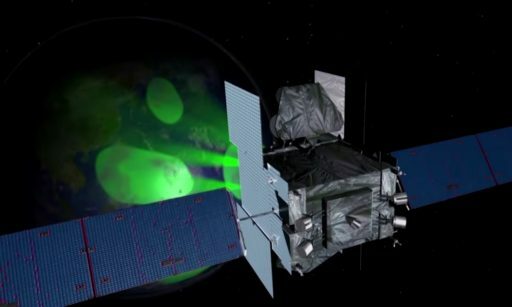 The RL-10 engine will come to life a second time at T+29:27 for a burn of three minutes and nine seconds, targeting a highly elliptical orbit of 435 by 44,372 Kilometers, inclined 27 degrees from where the WGS 9 satellite will use its R-4D bi-propellant engine to maneuver into an as of yet unknown position in Geostationary Orbit. 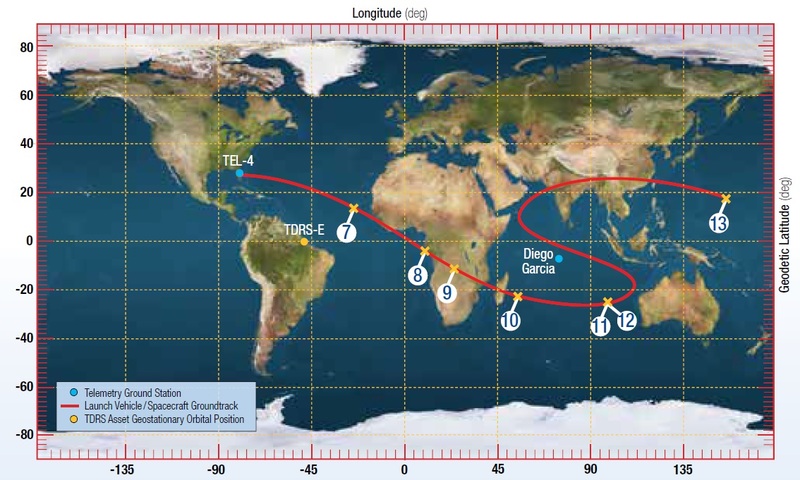 Spacecraft separation is planned 41 minutes and 46 seconds to send WGS 9 on its 14-year mission. WGS launches prior to WGS 8 made use of a typical Supersynchronous injection into an orbit with a 65,000-Kilometer apogee, however, mission designers elected to change the orbital parameters for subsequent missions to permit the Delta Cryogenic Second Stage to save sufficient propellant to remove itself from orbit. This measure is implemented in an initiative of the Air Force for space debris mitigation that calls for rocket stages to be deorbited whenever possible within the scope of a mission. Weighing a number of technical and risk factors, it was decided that the lower injection orbit has no negative impact on the overall mission of the WGS satellites in terms of propellant availability while affording the opportunity of removing the spent upper stage from orbit. To that end, Delta IV will re-light its RL-10B engine for a ten-second deorbit burn one hour and 11 minutes into the mission, half an hour after spacecraft separation. This retrograde maneuver will sufficiently slow the upper stage to drop the perigee altitude of its orbit into the dense layers of the atmosphere. The DCSS will re-enter after one complete orbit with impact predicted 12 hours and 12 minutes after launch in the Pacific Ocean. Saturday’s launch marks the third of the year for United Launch Alliance coming after two successful Atlas V launches with the SBIRS-GEO-3 missile warning satellite and the classified NROL-79 payload identified as a pair of ship-tracking satellites. 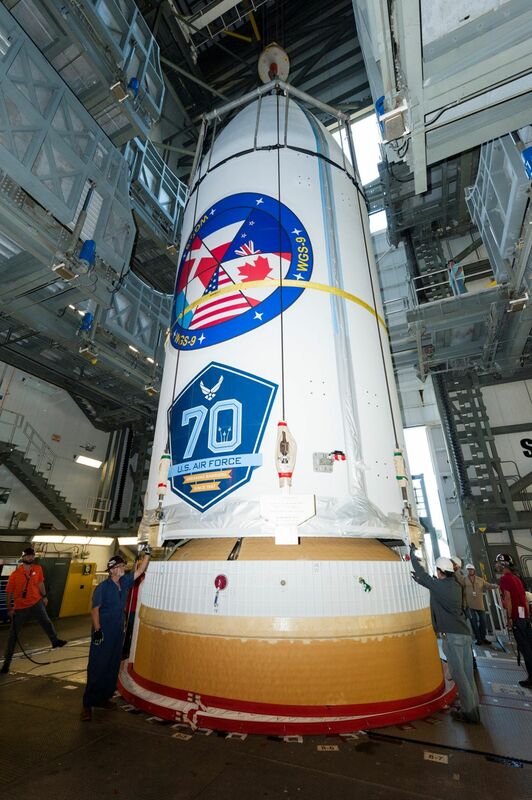 The company’s next mission is scheduled for an overnight liftoff on March 24 (local time) with the SS John Glenn – Orbital ATK’s seventh operational Cygnus mission to resupply the International Space Station.